It’s been one of those weeks, ya know? Kids cranky, lots going on, house a wreck . . . last night after cleaning up for tonight’s poker night, I just sat and watched some old ER episodes on DVD and made a really simple card for this week’s sketch. Thanks, Lori, for a fun one! It was just what I needed! Find the sketch here on Lori’s blog, then make sure to visit Cami, Charmaine, Laurie, Lori, Mary Jo, and Sharon and see what they did! If you upload to Splitcoast (and why shouldn’t you?! ), make sure to use keyword: WSC77! Stuff: The stripes are from American Crafts, Cupcakes are from Verve (Cupcake Affair) – some of my favorites. And just because. . . here’s another card I made with the same paper and colors! I love me some Kettos. . . This one is Charlotte! What an adorable card, Jenn! I LOVE the colors and that striped paper and polka dot ribbon is just awesome! Have a wonderful weekend! Cupcsakes DO make everything better…. dang, that’s what I’m missing. I NEED CUPCAKES! Beautiful Jenn! These are both fantastic! Hope your weekend is relaxing! Yes, I know your week, too, Jenn (wink!). 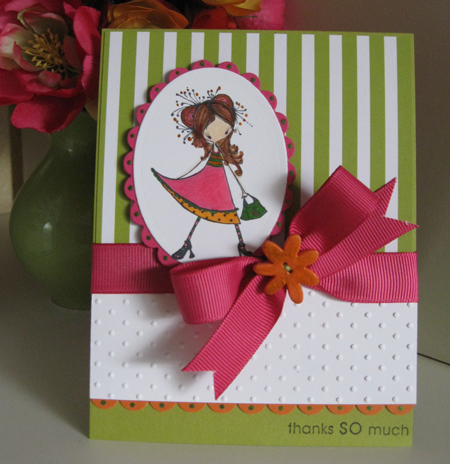 Beautiful cards … love the shape of your “cupcakes make everything better” cut-out. Such a sweet cupcake! Let’s hope our weekends are better, although with the rain that’s setting in for the next few days, I don’t think that’s going to make the restless kids any better! Oh I just love both of these – but then I love anything with stripes. Hope your weekend is better. AAaaack!!! 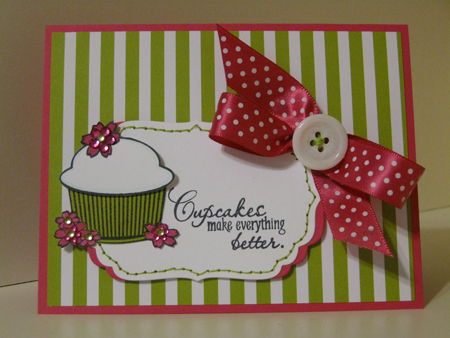 I LOVE that green striped paper…and it’s so perfect for a cupcake card!! LOVE it!! And you made a “just because” card??!!!? You are amazing (and so is that bow…talk about perfection!)! So stinkin’ adorable Jenn! Love the simple bold quality of these – so fun and striking! I love both cards. The colors are so nice. You Rock!! Have a great weekend. Darling – the cupcakes and the ketto – signature Jenn… Here’s to a super long feeling weekend! Hugs! Both are just wonderful, however you are killing me with those Ketto images! I really need to place a Bella order soon! I feel you on being busy, both of mine are in sports and I am so excited for summer and lazy days!! Jenn – I LOVE the cupcake card especially, though both cards are great. The colors, striped, polka dots, and red. What could go wrong with those incorporated into a card. Love ’em!!!! These are both fabulous Jenn!! You amaze me…just sat down and whipped these up,huh?! WOW!! Love what you did with this week’s sketch, I am off to make one too!! And, cupcakes DO make everything better, especially if they are chocolate, lol! what a sweet, sweet image! great paper and colors, love your wsc card too! great work, girlie! Love both cards! The colors are yummy! We had our little poker game last night…..just family, and only 10 bucks in change! : ) But it was still fun!